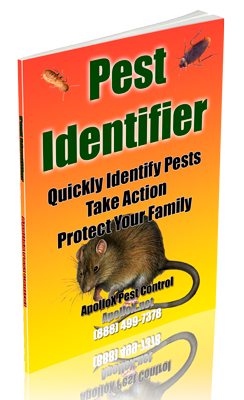 ApolloX Pest Control will remove cicada killer wasps from your home quickly, efficiently, and safely. 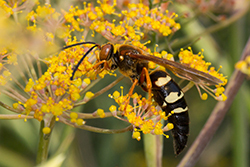 Cicada killer wasps reach up to 1-½ inch in length. Except for a rusty red head and thorax, they are overall black or rusty in color, with yellow band markings on the abdominal segments. They have russet colored wings. 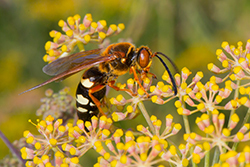 Cicada killer wasps appear in mid to late summer (July-August, coinciding with the appearance of cicadas which they attack, sting and paralyze). They dig annoying holes in lawns, flower beds, gardens, and sandy areas. They dig their burrows about 6 inches deep before turning and extending another 6 or more inches. Tunnels may be branched and end in one or more globular cells. 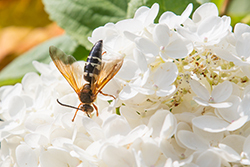 Although Cicada Killer Wasps rarely sting unless disturbed, homeowners may become alarmed because of their very large size (nearly two inches). They appear in mid to late summer. One of the largest wasps encountered; although females are capable of stinging, they are rarely aggressive towards man or animals; males are incapable of stinging, but can be more aggressive; large numbers of females nesting in localized areas such as sandy embankments can be a nuisance and cause concern because of their large size, low flight and nesting activities; nest entrances are often accompanied by a pile of soil excavated from the burrow that may disturb turfgrass. 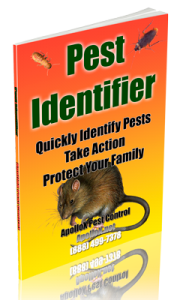 Call ApolloX Pest Control for cicada killer wasps pest control in the Fairfield County CT towns of Fairfield, Black Rock, Bridgeport, Cos Cob, Darien, Easton, Greenfield Hill, Greenwich, New Canaan, Noroton, North Stamford, Norwalk, Old Greenwich, Redding (lower), Ridgefield (lower), Riverside, Rowayton, Shelton, Southport, Stamford, Stratford, Trumbull, Weston, Westport & Wilton.